Preferred Habitat: Young woodlands and overgrown fields. Seasonal Occurrence: Common in spring and fall. 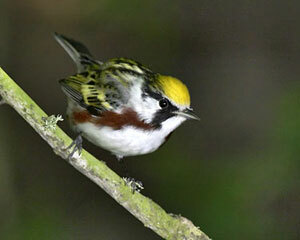 Profile by Glenn Olsen: An uncommonly beautiful bird but common in spring migration is the Chestnut-sided Warbler. The beauty of this bird is sometimes overlooked because it is not so brightly colored as some warblers and songbirds. But take some time to absorb and enjoy the softly colored but distinct and elegant beauty of a male and you will have found the key to a deeper appreciation of all birds. Females are also beautiful but are less colorful. The name is an appropriate description as the males have a chestnut streak along their sides. Clean all-white underparts, a yellow-green crown, yellow-green and black back, black eyeline and malar stripe which contrasts with the white cheeks are the key features for identification. Females, as in many species, are less colorful. Field marks are more muted and indistinct but similar to the male's markings. We can find this species on the Texas Upper Coast during spring and fall migration. In spring, individuals leave their wintering grounds of Central America, Columbia and Venezuela and head for their breeding grounds in the Great Smoky Mountains; northeastern and midwestern states; and southern Canada. This is the best time to see this species in near-prime breeding plumage. This warbler can be found in the oaks at High Island sanctuaries but may also be found at eye level in shrubs, bushes, or vines as it searches for insects, insect eggs, and caterpillars to maintain health and restore energy for the many more miles it has to travel to reach the breeding grounds. So, this spring take a day to explore the sanctuaries of High Island and search for this amazing little warbler. I think that in doing so you will make many other discoveries.